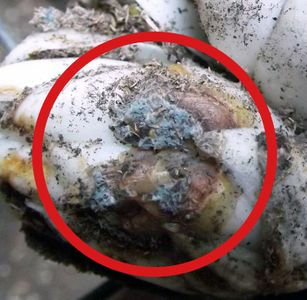 Blue-green mold on lily bulbs! Home | More to consider... | FAQ | Blue-green mold on lily bulbs! Blue-green mold on stored lily bulbs; should I be concerned? This is simply a Penicillin mold, which does not harm bulbs. Lilies are very high in sugar content (their stored food for the next season's growth) and during storage Penicillin growth often appears where there might have been a small harvesting bruise. If you wish, you can remove the affected scales. The mold dies upon planting and will not "contaminate" your soil. The bulb shown was too small to sell in fall so spent the winter in the cooler. There was no need to remove the affected scales, but the bulb itself had already split and so was pulled apart into two bulbs for the field.